Fridays and Saturdays (5.00pm to midnight). RUNNING a restaurant that has lasted a decade at the popular and ever-changing Changkat Bukit Bintang is quite a feat and Ciccio Ristorante Bar Pizzeria owner Yvonne Tan and her partner can proudly say that they have done it. “We started out as a simple bar serving pizzas and bruschettas. There were not that many outlets here back then and we did very well because the World Cup was held that year and people would watch matches here. Woody feeling:The recentlyrenovated andsports a sleekand classyinterior. “After the World Cup, the profile of our customers changed. They came back to the restaurant for the food so we expanded it to be more of a trattoria (casual restaurant). More and more bars started opening here and now our concept is a restaurant-bar,” said Tan. 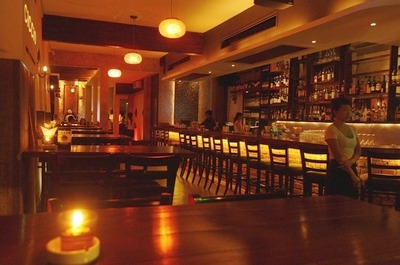 The restaurant was recently renovated and now sports a sleek and classy interior with high wooden-top tables lined up neatly along wall opposite the bar. “Our food menu still remains the same. We have nothing fancy on the menu. Just lots of classic dishes. It’s more about the consistency and quality of the food. This is what keeps our regular customers coming back,” she said. 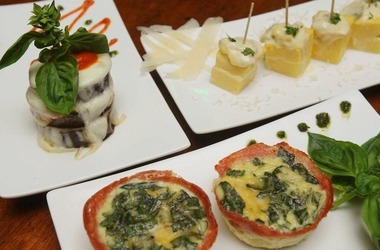 Bite size: Introducing a set of Cicchetti side dishes that would nicely complementa glass of wine or cocktail. From the plain Margherita to the more complex Capricciosa with turkey ham, artichokes, white asparagus, mushrooms and oregano, its extensive selection of wood-fired pizzas remains Ciccio’s signature crowd-puller. Biting into the hand-made pizza, the fresh ingredients and thin dough was a delight on the palate. Besides the pizzas, there was also a selection of home made pastas like the Ravioli Spinaci e Ricotta (ricotta and spinacch tavioli with tomato basil sauce), Tortellini Boscaiola (chicken tortellini with mushrooms, peas, turkey ham, tomato sauce and cream) and Lasagna. The Ravioli Di Zucca (pumpkin ravioli with butter, sage and poppy seeds) that Tan recommended was served with a rich butter sauce and the pasta itself was firm to the bite. 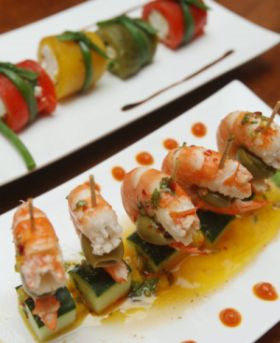 Finger food:The prawnskewers (front)and rolledcapsicums withfeta cheese andlemon zest aresome of theitems from thenew selection ofCicchetti. Tan said that they would be adding a Cicchetti menu consisting of bite-sized side dishes like mini skewered prawns or feta cheese and lemon zest rolled in capsicum. These light dishes made for a nice accompaniment to a glass of wine or cocktail. Ciccio has a range of drinks on its menu but if nothing on the list tickles your fancy, restaurant manager Lele Puletto, who joined the establishment recently, also doubles as a bartender and would gladly surprise you with his own concoctions.